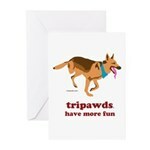 Laughter is the best therapy for Tripawds! 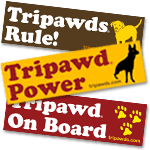 That’s why the new Tri Not To Laugh category in the Tripawds Gift Shop features fun designs and slogans on t-shirts, bags, mugs, gift cards and more. 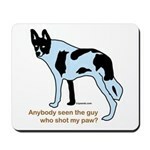 If you’ve never heard that one, check out this true story about a Native American who told us this funny three legged dog joke upon meeting Jerry under the big Paul Bunyan statue in Bemidji, WI. 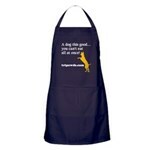 The first item we added featuring this humorous design, was the Tripawds BBQ Apron after hearing the funny replies during Tika’s camping adventure. 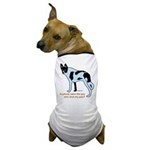 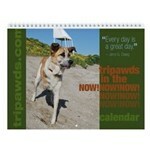 Agile Cow Dog Maggie, with her ever-present happy little grin seemed like the perfect match for this funny slogan.